We have had quite a busy break already! With special permission, my family got to call Patrick two days early so Isaac and I could be there for his one and only Christmas call (he was in the MTC last year). He sounds somewhat more mature, he talked a lot more than Mother's Day, and he sang us a song that he made up. I was only able to record a part of it, and it's not a brilliant song, but the sentiment is good, and he has a nice voice. It was awesome to hear from him. We got to go to Tennessee to be with Isaac's family for Christmas. We had a beautifully smooth trip out, no delays, and no problems. It was great to spend time with everyone since we are so spread out. 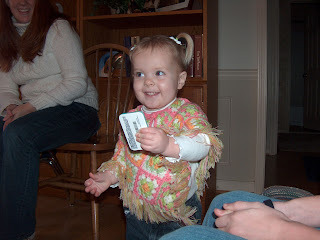 We played games and had lots of time to talk, and everyone enjoyed watching Grace. Oh, and we got a beautiful silk plant today for free. 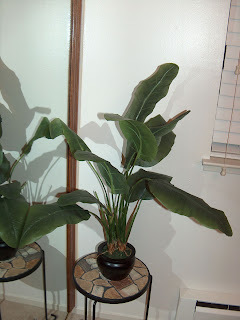 I am happy to have a plant that I cannot kill, even though I seem to have quite a knack for that. Thanks for posting these pictures. 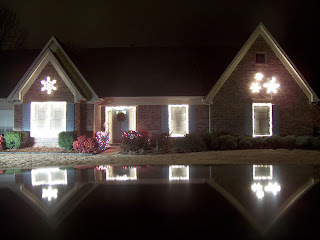 The one of the house and the reflection is beautiful. You really have an eye for pictures! Also I LOVE the picture of Grace (but I'm unabashedly biased!). It was great to see you guys. And thanks again for playing with Gracie.